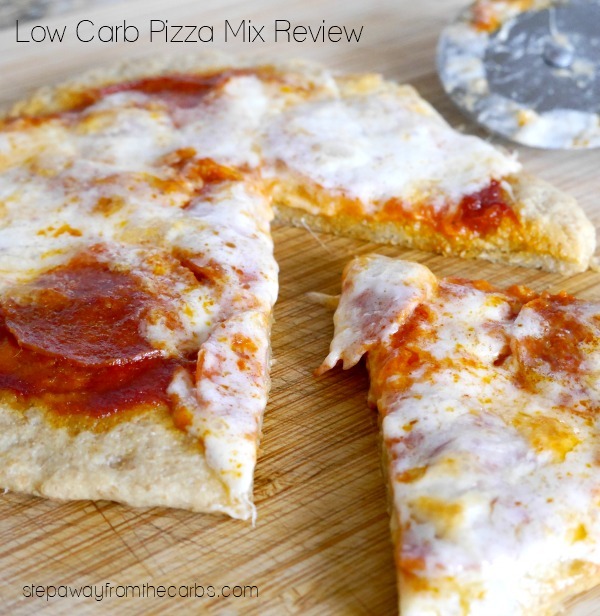 This low carb pizza mix is certainly a good alternative to the high carb version! Disclosure: I was provided with this Pizza Mix from LC Foods free of charge in exchange for my fair and honest review. Please see my disclosure policy. Pizza. I don’t think there are any low-carbers out there who don’t crave “real” pizza. But, we must be strong. There are many great recipes for making alternative pizza crusts, including cauliflower crusts, low carb tortilla crust, pork rind crust, or even a cheese and egg mixture! 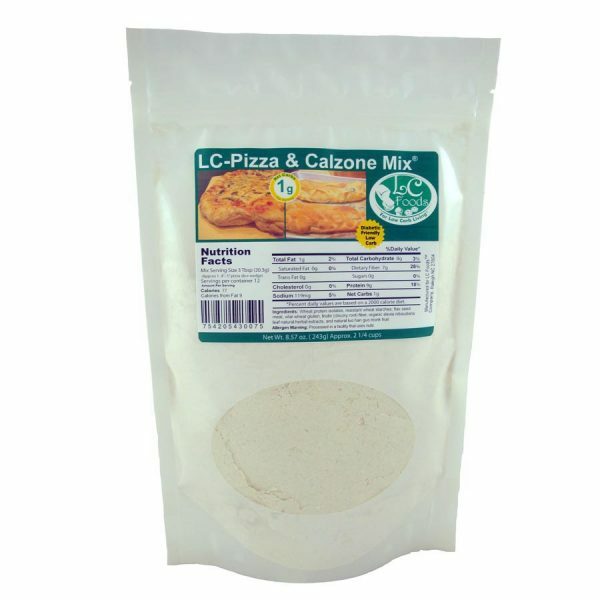 But I thought it was worth checking out this Low Carb Pizza and Calzone Mix from LC Foods. Instructions are fairly straight forward – add olive oil, warm water, and instant yeast to the mix, form a dough, then knead it. Then leave it in a warm place for 30-60 minutes until it doubles or triples in size. I’ve tried this three times and I didn’t get anywhere near tripling! But it was probably close to doubling. 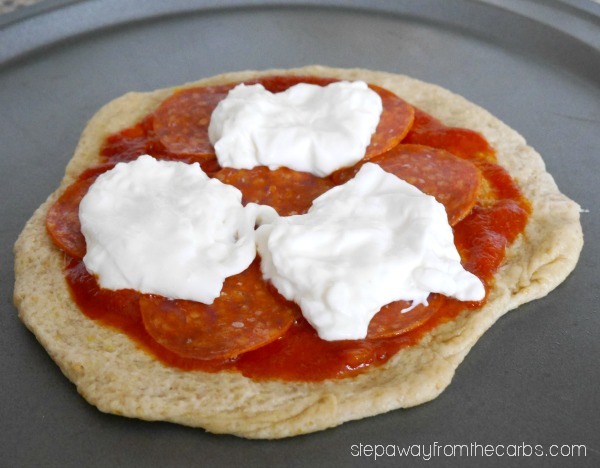 Then form it into a pizza shape. The whole bag makes three small pizzas – about 8-10″ diameter each. Prebaking the crust is a pretty good idea – it only needs a few minutes before adding toppings. Pictured here is tomato sauce, pepperoni leftover from making Pepperoni Chips, and some yummy burrata! Then bake it like a normal pizza. Taste wise the crust is very pleasant – just filling enough without being too hearty. 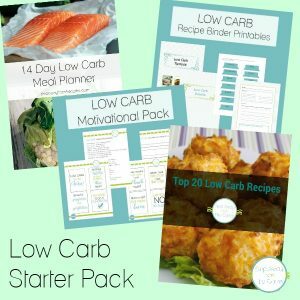 As for carbohydrates I confess that like the Low Carb Pancake Mix I didn’t find the serving size particularly easy to understand. So the label states that one serving is three tablespoons of the mix which is approximately 4-5″ pizza slice. I guess they’re saying that one 8-10″ pizza is two servings, which is certainly not the case where I am concerned!! However, the net carbs per serving are only 1g, so if I do just happen to eat the whole pizza, the crust is only 2g net carbs. Plus the toppings, of course. And that sounds great to me! These are definitely good enough to serve at parties – although three small pizzas might not go round many people! 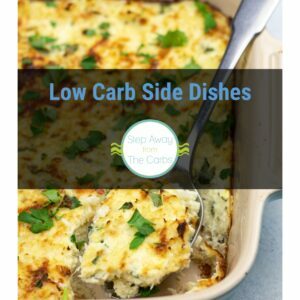 Next I think I will try the Freshly Baked Low Carb Pizza Shells! That is one of my pet peeves about LC Foods. Their nutrition information is always stated in terms or quantities that are not representative of commonly used terms, at least in my part of the US. I would love to be able to readily discern what the values for the product are without having to be an international quantities and measures expert. Give us a break and try some real world nutrition information along with the current info if you must continue to use that. > three tablespoons of the mix which is approximately 4-5″ pizza slice. No I don’t think that’s what they’re saying. I think they mean one slice of an 8-to-10″ pizza, i.e. the slice would be 4-5″ (the radius of the whole pie). But what is unsaid is how large is the slice? A quarter of the whole pie? One tenth of the whole pie? Huge unanswered question. I completely agree with Ken Mourey – LC Foods is being completely (perhaps intentionally) obscure. > the whole pizza, the crust is only 2g net carbs. No. Firstly the “serving” size is not half the pizza (presumably, although they don’t define “slice”). It is some kind of slice, but who knows how large (see above). Secondly, as the label shows, each “serving” (whatever that is) has *7* grams of carbs, not 1. 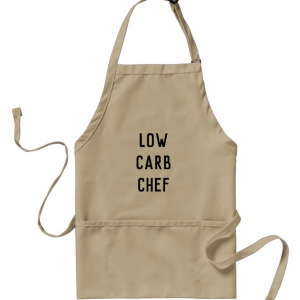 The 1g is “net carbs” (i.e. 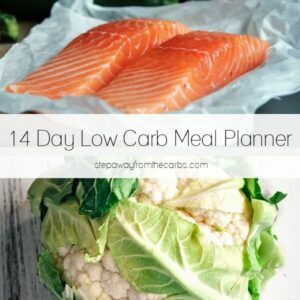 “pretend carbs”), not actual countable carbs (unless you follow the Atkins pretend carbs idea). Compute it this way: The label states that 1 serving is 3 Tbsp of the mix (the nutrition information applies to 3 Tbsp – ignore the mysterious slice size). There are 16 Tbsp in a cup, so the recipe on the back (3/4 cup) uses 12 Tbsp of mix, which is 4 times the “serving size” (nutrition label). So… the nutrition label “serving size” is 1/4th the total batch from the recipe on the back. It says it makes 3 8-10″ crusts, but many people only get 2 (plus the math is easier), so assuming you get 2 crusts/pizzas from the recipe then 1/2 of one of those pizzas (1/4 the total recipe) will equal one “serving size”. Which is 7 grams of actual, real carbs. Hello, I would like to clarify the question regarding the serving size of the pizza mix. It is approximate because we can’t really know for sure the exact size your pizza will turn out. There are many factors that determine the end result. The 4-5″ slice refers to the circumference (outside crust length) of one slice, again this is approximate. It may be a quarter of your pizza if your pizza is larger than 10″. We have made a best effort to determine the amount of net carbs in an average slice that can be made from our mix. I hope this clarifies. Thanks!